On Sunday, 25 September, David Barnard will take on the Grand to Grand Ultra in support of the END Fund and the fight against neglected tropical diseases (NTDs) in Africa. By participating in this extreme multi-stage race, Barnard has committed himself to raising awareness and funds to help the over 1.6-billion people worldwide whose lives are affected by NTDs. The Grand to Grand Ultra is a six-stage, 273km race held in the vicinity of one of the Seven Natural Wonders of the World, the Grand Canyon, in the United States. Barnard, a well-known South African tech and development activist and Africa Policy Advisory Board member of the ONE Campaign, is no stranger to extreme multi-stage races of this nature. 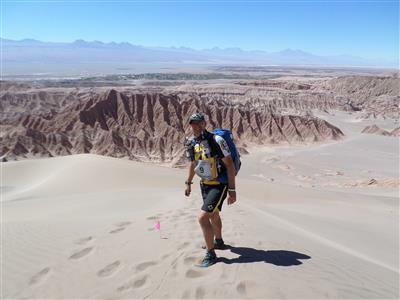 He has already completed races in the Kalahari, Namib, Sahara, Gobi and Atacama deserts, as well as Antarctica. This will be his first race in North America and the fifth leg of his quest to complete a desert race on all seven continents. Many parts of the world still reel from the health and socio-economic impacts that are caused by these diseases of neglect. Five of the most common NTDs, and ones the END Fund focuses on include trachoma, river blindness, schistosomiasis, intestinal worms, and lymphatic filariasis. While they may not cause immediate deaths like more globally known diseases such as malaria or HIV, they leave long-lasting devastation like disabilities, stunt education, and economic growth, and create other health problems that can lead to death. As Barnard embarks on his seven-day race at the end of this month, all funds raised will go towards END Fund initiatives in Africa. If you would like to donate to this cause, click here. For more information, visit www.end.org. Alternatively, connect with Barnard on Twitter.